This summer's first batch of sweet peas. Sweetly scented and strangely two-toned in colour. I've never seen sweet peas like this and hope they wont change to regular colours. Perhaps it's a sign that this week is going to be unique and not regular. Well we can hope can't we? I've always loved a doily which isn't surprising really seeing I've been born into the wrong era. Yes, at the ripe old age of 18 ,as well as going to wild parties held in people's barns deep in the Devon countryside; I spent my time at a lace pillow with my friend Lisa. It certainly wasn't the trendy thing to do in 1982 but we enjoyed it. Over the years I haven't done much lace making but that hasn't stopped me from collecting the odd doily or two or three. Only problem was I haven't really been sure what to do with them; well that is until now. The has been a doily revival! This post last November on the Decor8 blog totally inspires me and makes me feel like shouting "Hello my name is Jane and I love doilies!" - even if I'm a little behind the times..again! So out into the sunshine have come my poor little collection. I'm now trying to think of things to do with them so any ideas will be welcome. The large pink one in the first photo is currently being sewn on to a piece of lilac blanket and will be made into a cushion - it will then probably head to my shop. More shop news soon. So I encourage you to grab some doilies and turn them into something beautiful...they deserve it after all these years. Hello my friends - gosh I've been busy. I can't believe it has been so long since I last posted. I have lots of things on the go; a rapidly growing 'to sew' pile (like that a lot); an even bigger 'to paint' pile (which has taken over the entire dining room table); a much needed dead heading session in the garden (which includes the hedge outside our front door, which is seriously impeding our entrance and exit!) Oh I wish I had a week off school.. Anyway, here's my latest favourite find. The family got a bit fed up at having to be 'consulted' which meant being called into the room to be asked, 100 times, if they thought it really did look better painted and was the colour OK? None of them particularly like the screen at all and can't see why I'm so enamored by it. It is awaiting the 2nd coat of magnolia but I still might paint it green! Gee whizz I'm terrible at choosing paint colours and get myself in such a dither. Tom says I'm quite sad and I have to agree with him on this one. Whilst I had the magnolia out I painted 3 picture frames so my wall of flowers will look fuller in a day or so. I'll show you then. And lastly, my new plates and a cute flowery ceramic jar were my second best finds. Hope your weekend was just as fruitful. Thank you, thank you for showering me in kindness by your reassuring comments. I feel so privileged to share my blog with you all. Thank you too for all your helpful suggestions re my migraines; I'm certainly looking into a few of them though I have tried many over the years. My mother has found that going through the menopause has helped her migraine and I think mine are mainly hormonal, so here's hoping. Not that I'm wishing my life away! The photo is of my latest car boot purchase - 2 vintage, wicker beside cabinets. You must be totally fed up of pictures of things on my bedside table as it has featured rather a lot in the last few months..but I couldn't resist this bargain. I lined mine with old Laura Ashley wallpaper but left Anth's plain as I didn't thing he would quite appreciate it in the same way. He's so patient with my floral obsession and I don't want to over step the mark! Mmm must do something about that phone and lampshade though! I also found this small frame that once was gold and now is white. Shabby white. The picture is a label from Alice's pyjamas that was too lovely to throw away and looks just right. I hoping that having to move my radio and the inevitable pile of books every time I need a clean pair of knickers, won't prove to be too tiresome. But we'll see. As Typepad have made a few changes and I cannot find a facility to do a word or phrase search of my past posts, I'm not sure if I have ever shown you this bag. It started it's life as a feather pillow and the pillow was lying on the ground dirty and overlooked. I bought it for 50p and spent a bit of time de-feathering it and giving it a jolly good wash and turned it into a drawstring bag. I love the print so much I have hung it on our bedroom door so I can see it when I lie in bed. Today is the day Coldplay have released Viva La Vida and I've just put it on my ipod. I'm going to turn off my mobile, go upstairs, lie on our bed and fill the room with Chris' wonderful voice...I'll let you know what I think! First a little sceneiro that made me laugh yesterday. you have to negotiate buckets of blooms on the steps, plus an over-grown hedge. My habit of using buckets, chimney pots and tin baths in the garden has made my mother often say it looks like Steptoe's back yard. Well, she has a point I suppose. I tell the children at school that I have flowers on pratically everything from our front doormat (which isn't looking quite so bright now) walls, plates, cushions, dish cloths, glasses, to my bedlinen. Mmm pillowcases. I bought these pillowcases, and a few more besides, from dear Amy of Four Sisters in a Cottage. I wonder why they don't make them like this anymore? She is such a sweet lady and her shop hosts a fabulous collection of vintage goodies. She updates it when she can and I always marvel at how much she has, and regret that I don't live in Iowa, mmm.. perhaps that is a good thing! I just can't resist vintage bedlinen, especially pillowcases and now have a little storage problem. And there's a few more, but don't tell the family. My little problem started in 1982 and it's all Laura Ashleys fault. After growing up in a hotel and only having white hotel linen I've gone on to be passionate about how I dress our beds, even when I was choosing cot bedding 18 years ago. Not even my wardrobe gets as much thought. But hey, no flowers for Tom; no, Tom has stripes or gingham - I think he'd want me to point that out! Life has been a bit damanding recently and I'm still struggling with my bad head. That migraine, which keeps returning, is now into it's 14th day, and I can't quite get rid of it and it's wearing me down. Writing my blog is a joy to me, the connections I've made with like-minded woman have been so rewarding and enriching, it's great to think that I'm not alone in liking what I do and that there are many like me whose heart would leap at the sight of a box saying 'everything 50p'. But I've been struggling to reply to all of your comments, and this is stressing me as there are just not enough hours in the day, especially a day when I'm at school. I feel really bad about this as I think that it is only right that I should acknowledge your comment and thank you, as I so enjoy hearing from you. But it's with regret that I've decided that I will only reply to your comments if time will allow. I can and, I will, always reply to an email. Thank you, I hope you understand. I'm not sure when it started; no that's not true, I think I do. 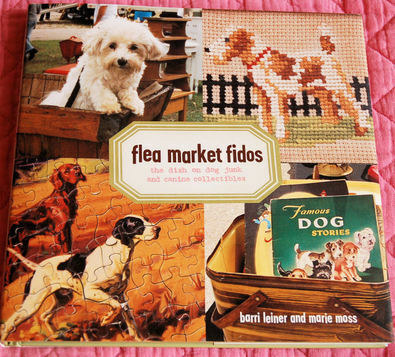 It was probably the fault of these books by Barri Leiner and Marie Moss particularly Flea Market Fidos. which has sweet black and white illustrations. and so I think that this might just be the beginning. Before I talk about my new peg bag, I just want to thank you for all your good wishes about my migraine. I may not be able to acknowledge everyone's comments but I do appreciate them. Very much. It helps me feel I'm not alone. Now to the new peg bag. I managed to do some sewing last week, not as much as I wanted to, but this was a project I needed to do fairly urgently as our old peg bag has finally given up the ghost; plus I didn't make it quite deep enough and the pegs were always falling out. I used an old table runner which had 2 identical embroideries at either end so I made 2 bags and the other one will be for sale in my shop soon. Talking about my shop, there will be exciting news to announce very soon so watch this space. our ironing pile. It doesn't hold the record for being the biggest in our ironing history, but it can't fit in it's usual home, the cupboard under the stairs. It has now taken residence in the middle of our sitting room floor where husbands, children and cats seem oblivious to it's ever increasing size. Perhaps, when it gets so big and blocks the view of the T.V so that Scrubs and the All Blacks can't be seen, someone might offer to do some. Yeah, I won't hold my breath!